The Fremantle Workers Club is holding a Clearance Sale this Thursday at 10 William Street, so go and check it out and buy some bargains. The Fremantle Workers Club present the ZYDECATS at the Fly by Night Club in the gorgeous Victoria Hall this Sunday from 6 pm. It’s going to be a rainy day so why not enjoy the invigorating sounds of one of Freo’s most loved bands. Tickets are only $ 10.00 and for members of the two clubs $ 5.00. The invigorating ZYDECATS are playing at the Fremantle Workers Club at Fremantle Oval today from 6-9 pm so put your dancing shoes on and have some fun. There will be delicious Venezuelan Cachapas, Empanadas and Arepas to eat and the bar is open. 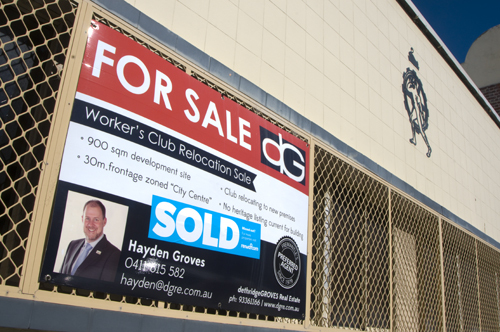 The Fremantle Workers Club in a prime inner city West End location in Henry Street has been sold but the club does not want to divulge who the new owner is until settlement has been reached. Any new development in the West End of Fremantle has to be extremely sensitive to the important heritage of the area, so it will be interesting to see what the new owner wants to do with it.